International Trade Fair for Construction Machinery, Building Materials Machines, Mining Machines &Construction Vehicles 27 – 30 November, Shanghai by Mr. Om Prakash – Director, InORBIT Tours Pvt. Ltd.
Bauma China, the International Trade Fair for Construction Machinery, Building Material Machines, Construction Vehicles and Equipment will be taking place from 27 to 30 November 2018 in the Shanghai New International Expo Centre (SNIEC). 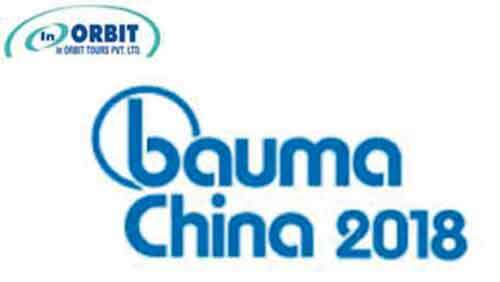 Bauma China takes place in Shanghai every two years and is Asia’s leading platform for experts in the sector. At Bauma 2016 - 2958 exhibitors from 41 countries and more than 170,000 trade visitors from 149 countries participated. The show once again occupied all 300,000 square meters of exhibition space at the Shanghai New International Expo Centre. Bauma China promotes interaction among exhibitors and visitors by responding better to their needs, facilitating trade and communication more intelligently and digitally,and providing participants with efficient services. All the international key players will present their machines and products at bauma China. 93 percent of all visitors here are decision-makers who are looking specifically for new solutions: CEOs, managers, investors and buyers from around the world—and of course from Asia’s major growth markets in particular. Kindly publish/circulate the information for the benefit of your readers/members.